When Atlanta is struck by a severe snowstorm, Mina must perform a big surgery – without the help of The Raptor – to save the life of a young father, while Kit and Bell get stuck babysitting the man’s children. Nic and Conrad experience a disagreement with a patient’s treatment, causing further strain in their relationship. Meanwhile, Devon teaches an important lesson about life and death to a first-year med student. Guest Cast: Tasso Feldman as Dr. Irving Feldman, Julianna Gull as Jessie Nevin, Shannon Wilcox as Donna Jackson, Jada Harris as Eva Garcia, Miles Gaston Villanueva as Dr. Alec Shaw, Adam Irigoyen as Erik Teter, Jessica Miesel as Nurse Jessica Moore and Catherine Dyer as Nurse Alexis Stevens. Air Date: Monday, April 1 (8:00-9:00 PM ET/PT) on FOX. 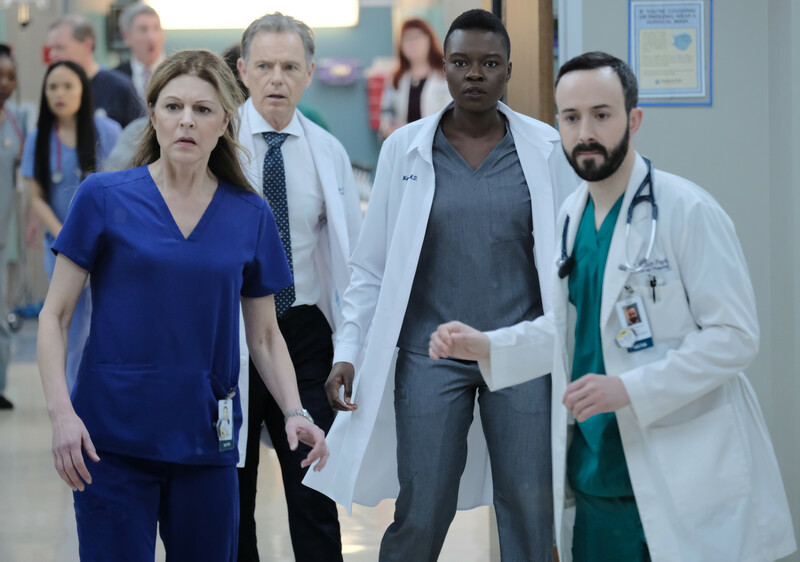 THE RESIDENT: L-R: Jane Leaves, Bruce Greenwood, Shaunette Renée Wilson and guest star Tasso Feldman in the "Snowed In" episode of THE RESIDENT airing Monday, March 25 (8:00-9:00 PM ET/PT) on FOX. ©2018 Fox Broadcasting Co. Cr: Guy D'Alema/FOX.